When it comes to salad I won’t accept anything less than amazing. No matter how good it is for me, if it doesn’t excite me it just isn’t going to be made. My secret to creating drool-worthy salads is this – pop your favourite ingredients in it. And no, I’m not talking about lettuce (is that anyone’s favourite ingredient??). Roast Pumpkin would have to be one of my all-time favourite salad ingredients, followed closely by avocado and ALL THE CHEESE. So it’s really no surprise that this Roast Pumpkin, Spinach and Feta Salad with Honey Balsamic Dressing is one that I’m obsessed with. I made it for the first time for Christmas lunch and out of the 5 or so salads we had on the table, this one was the only one that was completely demolished. A sign of a good salad if there ever was one. I’ve since made it a few more times and I just can’t get enough of it. It’s a no stress, simple salad made with everyday ingredients. Serve it as a meal on its own or a tasty side next to some barbecued meat. Pumpkin: Any good roasting pumpkin or squash will work well. I use jap or kent varieties here in Australia. Oil: I use two different types of oil in this recipe – Olive Oil and Extra Virgin Olive Oil (EVOO). Olive oil is great for roasting, and EVOO is perfect for salad dressings. Nuts: I’ve been loving using chopped almonds in salads lately. It helps that I almost always have almonds on hand, and either raw or dry roasted work perfectly. Having said that, many nuts would compliment this salad well. 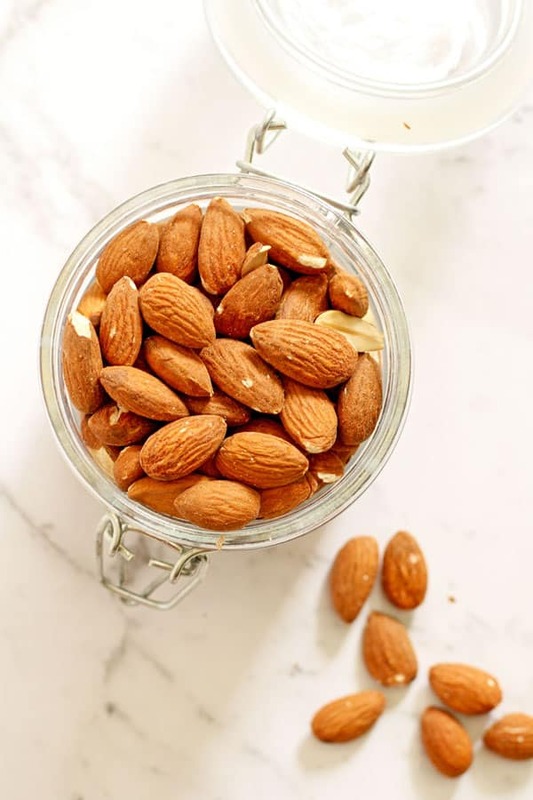 If you don’t have almonds on hand, try pine nuts or walnuts instead. Dressing: I’ve made a simple honey balsamic dressing for this salad. If honey isn’t your thing, you can substitute for maple syrup or brown rice / rice malt syrup OR simply omit altogether if you don’t want a sweetener. The key when roasting pumpkins to put in salads is to ensure its golden and tender but not MUSHY. The pumpkin will be mushy if it’s cooked too long, so it helps to keep an eye on it while it’s roasting. Place pumpkin pieces on baking tray lined with baking paper / silicone mat and drizzle olive oil on top. 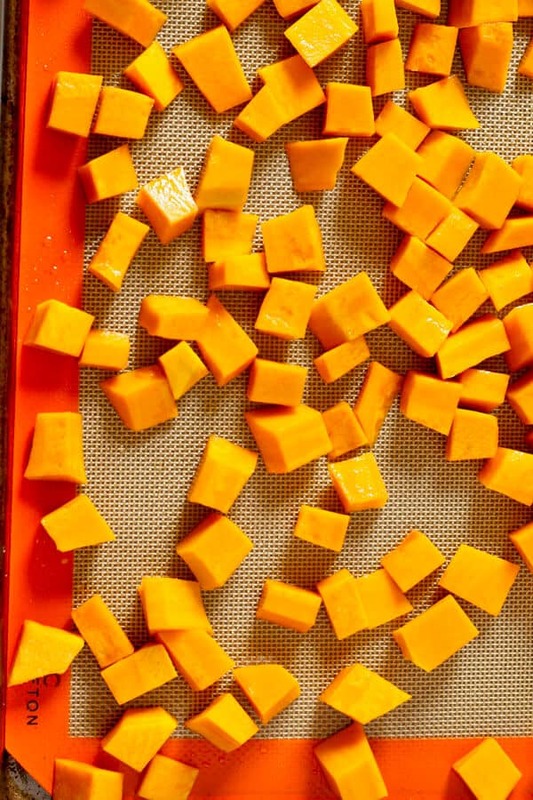 Use your hands to ensure all pieces are covered, then spread pumpkin out in a single layer with no pieces touching. Roast for 20 minutes, flipping half way (use an egg flip if the pumpkin is sticking) until the pumpkin is golden and fork tender. Allow to cool slightly or completely (depending on your preference) before adding to your salad. How long can I store this salad for? 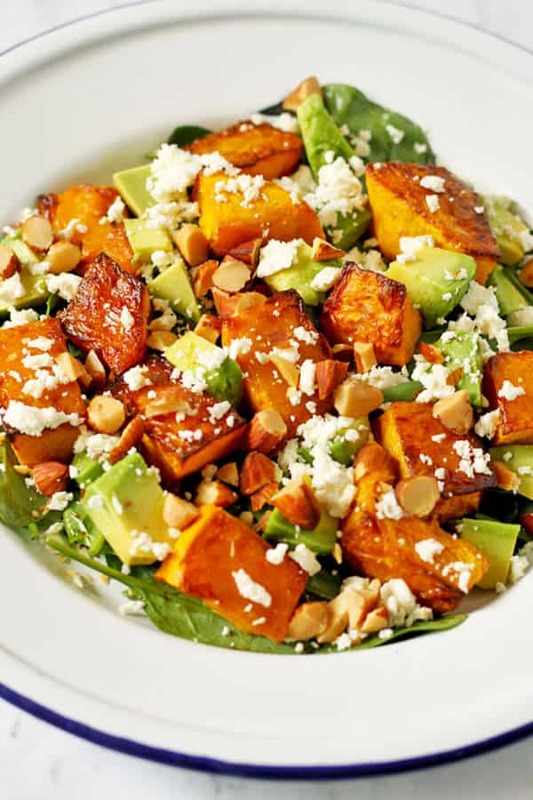 You can prep your roast pumpkin ahead to make this salad even quicker to prepare. Roast pumpkin will be good in the fridge for up to 5 days, allowing you to easily portion out for take to work lunches or an easy weeknight dinner. You can also prep the salad minus the dressing, nuts and avocado and portion out for a day or two. Then when the time comes simply add in the rest of the ingredients. I don’t recommend prepping salads too far in advance, as I find the ingredients don’t tend to hold up that well. But prepping this for a work lunch the night before is absolutely fine. 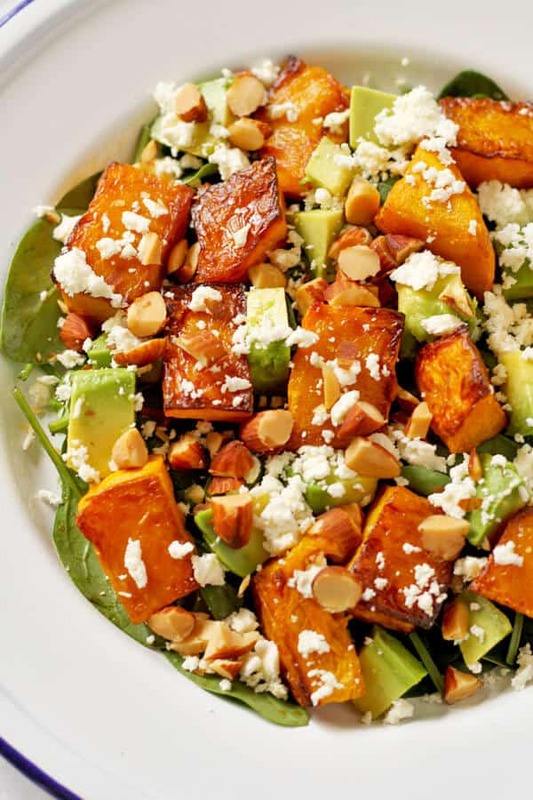 If you’ve tried this Roast Pumpkin, Spinach and Feta Salad I’d love to hear how you enjoyed it! Pop a comment and a star rating below! You can also FOLLOW ME on FACEBOOK, INSTAGRAM and PINTEREST to keep up to date with more delicious recipes. 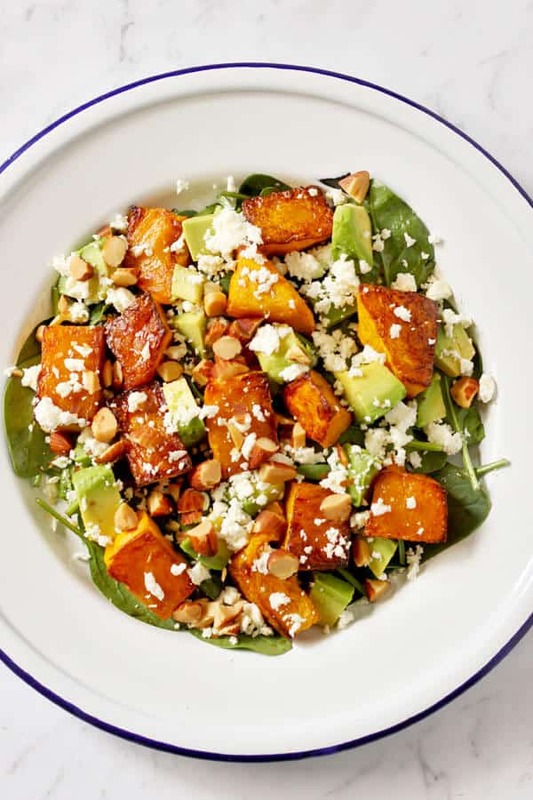 This Roast Pumpkin, Spinach and Feta Salad with Honey Balsamic Dressing is a bright and fresh antidote to bland and boring salads. It's great as a meal on its own or paired with some tasty barbecued meat as the perfect side dish. Place dressing ingredients in a jar, loosen honey with a spoon then secure the lid and shake vigorously until combined. Arrange salad ingredients in a bowl, drizzle with dressing and lightly toss. Pumpkin - Any good roasting pumpkin or squash will work well. I use jap or kent varieties here in Australia. Roast pumpkin turns mushy when cooked too long. Keep an eye on it while roasting - you want it golden and fork tender but still holding its shape. If pumpkin is sticking to the tray, loosen with an egg flip. Oil - I use two different types of oil in this recipe – Olive Oil and Extra Virgin Olive Oil (EVOO). Olive oil is great for roasting, and EVOO is perfect for salad dressings. Nuts - Many nuts would compliment this salad well. If you don’t have almonds on hand, try pine nuts or walnuts instead. Dressing - If honey isn’t your thing, you can substitute for maple syrup or brown rice / rice malt syrup OR simply omit altogether if you don’t want a sweetener. Storing - You can prep roast pumpkin ahead and will store in fridge for up to 5 days. You can also prep the salad minus dressings, avocado & nuts and store for up to 1-2 days. Nutrition - Nutrition information is a rough estimate based on 1 serve of this salad. We had a family bbq last weekend and I brought this.. Wasn’t any left – everyone loved it. This salad is perfect for sharing. So glad your family enjoyed it! 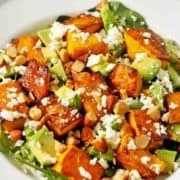 Roasted pumpkin makes salads amazing! Glad you liked this one and good tip about the toasted pine nuts. I’ll have to try!